Everyone has that one friend who celebrates every holiday with over-the-top enthusiasm, loads of decorations and themed outfits (down to the socks) for each event. Turns out there are animals like that, too. Butterscotch the Nigerian Dwarf goat is very into holidays. Kaymarie Kreidel, former jockey and current outrider at Laurel Park, has costumes for him for each and every occasion. He has a soft crown for his birthday, a unicorn costume for Halloween, and a green bow tie for St. Patrick's Day. He has a stable sheet, which looks like a miniature horse blanket, for chilly ordinary days on the calendar. 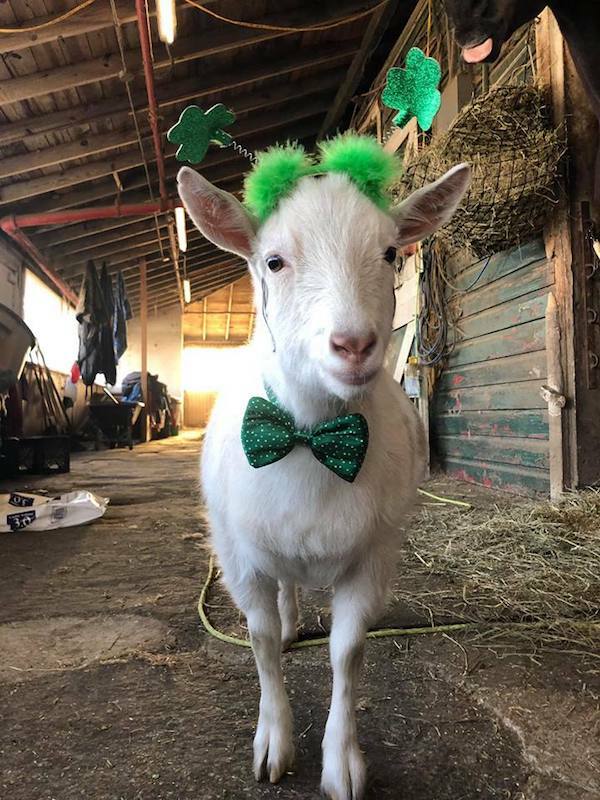 While many animals – including the dogs for whom these costumes are originally intended – would struggle against wearing something on their heads, particularly the fuzzy green headband with little clover 'ears' that goes with his St. Paddy's bow tie, Butterscotch loves it, Kreidel says. Possibly too much. Kreidel picked up Butterscotch from one of the track's veterinarians, who breeds Nigerian Dwarfs and keeps the females for her dairy. 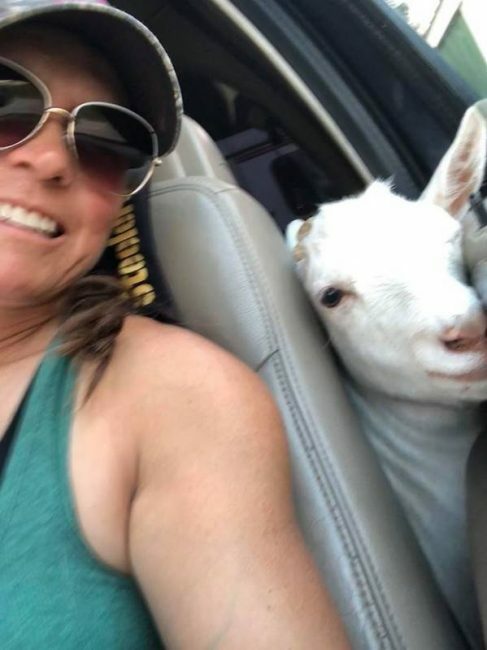 The veterinarian sent Kreidel a photo of the little white goat, who had splotches of golden brown on his back, as though he'd had butterscotch poured on him and Kreidel knew she had to have him. Kreidel brought tiny Butterscotch home in the cab of her pick-up truck when he was eight weeks old, and he has been stylin' at the track ever since. “As far as he knows, I'm his mother,” she said. Kreidel keeps one side of the Laurel pony barn shed row full with her horses (mostly OTTBs) so Butterscotch has the length of the row to run and play. She makes him a straw bed in front of one of the horse's stalls to discourage him from going inside and being stepped on accidentally. 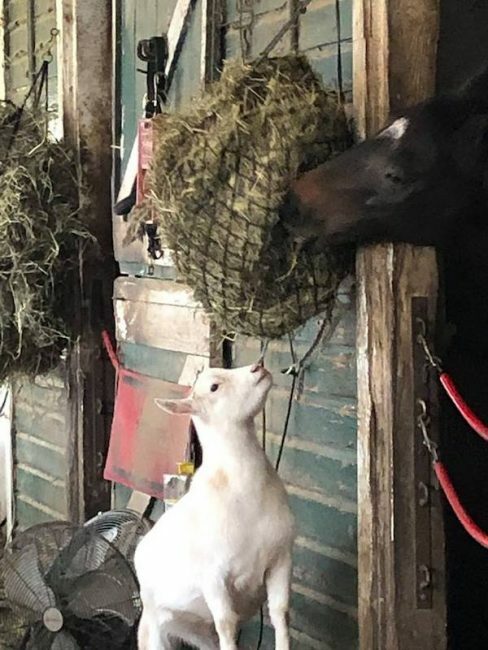 The diminutive goat, who stands about knee-high to Kreidel's horses, is very involved in the barn's routine. If Kreidel is able to catch a nap in her tack room between morning and afternoon work, Butterscotch stands guard by lying against the door, preventing anyone from passing. Of course, his weight also makes it difficult for her to get the door open to go back to work, but to Butterscotch, this seems a minor logistical detail. As Kreidel passes back and forth on the horse path leading horses, Butterscotch will stand in the barn doorway and greet her when he sees her go by. Counter to the stereotype for goats, Butterscotch will not eat just anything. Hay, a handful of horse grain, Apple Jacks cereal, and peanut butter cookies are the only things that interest him. And not just any peanut butter cookies – they must be made by Kreidel, and they must be made with Reese's peanut butter. Kreidel tried switching to a less expensive brand when she realized how much Butterscotch loved them, and he turned up his nose at that batch. Butterscotch is happy to stay in Kreidel's barn at the end of the day, though he does enjoy a good ride in the truck if he can get it. He would prefer to ride in Kreidel's lap, but she has taught him to sit in the back seat, where he stretches his head forward, resting his chin on her shoulder while she drives. Despite his tender young age (he's a little over 15 months old), Butterscotch is already famous. The Baltimore Sun ran a multimedia feature on Kreidel and Butterscotch ahead of last year's Preakness. Kreidel said she's had offers to bring him to Pimlico for Preakness day, but while he's still young she's hesitant to expose him to all the chaos of a big race day. Kreidel, 47, stepped back from full-time work as a jockey about seven years ago but keeps an active jockey's license and still participates in the Lady Legends and other all-female races from time to time. During her career in the starting gates, she piloted winners of $3 million and was a multiple stakes winner. She keeps busy in her role as an outrider, and when she's not at the track, she can be found with several of her track ponies on the eventing circuit in Maryland or teaching riding lessons. Everywhere she goes, people ask her about Butterscotch. 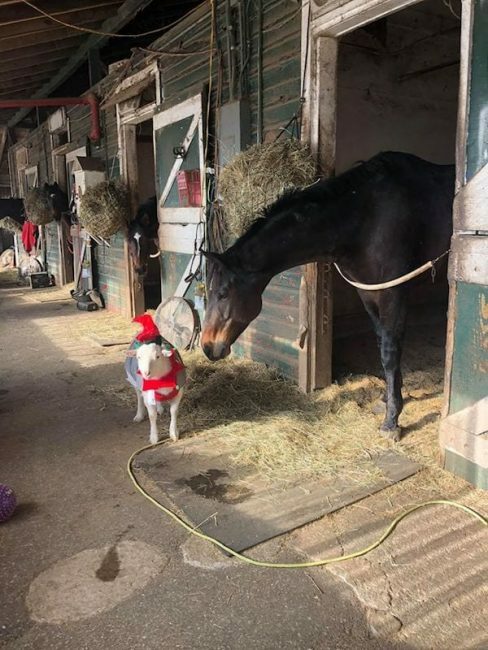 This entry was posted in Barn Buddies, Horse Care, NL List and tagged barn buddies, goats, kaymarie kreidel, laurel park, Maryland Jockey Club, outrider by Natalie Voss. Bookmark the permalink.